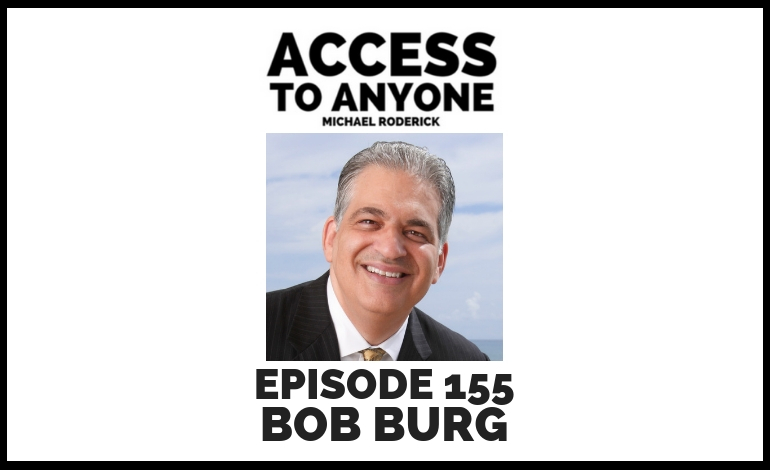 In this episode, I sit down with Bob Burg – speaker and author of the Go-Giver series of books. Listen in as Bob and I discuss his journey from struggling with sales to becoming world class at it, how he manages his time, and what the word “influencer” really means to him. Bob Burg is a sought-after speaker at company leadership and sales conferences on topics at the core of the Go-Giver books. A former television personality and top-producing salesperson, Bob has shared the platform with some of today’s top business leaders, broadcast personalities, coaches, athletes, and political leaders, including a former U.S. president. In addition to coauthoring the bestselling Go-Giver books with John David Mann, Bob has authored a number of popular books, including the critically acclaimed Endless Referrals: Network Your Everyday Contacts Into Sales and Adversaries into Allies. His total book sales are well over a million copies. The American Management Association named Bob one of the 30 Most Influential Leaders and he is one of Inc.’s 100 Great Leadership Speakers. Richtopia named him one of the Top 200 Most Influential Authors in the World.